is a gvSIG's extension to view in a agile way the records of vectorial geographical information layers. Its main characteristic is that allows to see the element's attributes one by one and in vertical direction. Some of its features are: edit alphanumeric values and navigate among the elements of an information layer. NavTable is a simple tool that was thought to get a more comfortable user experience in GIS. In spite of beeing a very recent development it is very useful in order to work with data everyday. Visualization of vectorial layers data in records one by one and in vertical direction. Allow to select and unselect elements. Edition of alphanumeric values on vectorial and alphanumeric tables. Direct copy of attributes from other register (from last or the selected record). Zoom: automatic and manual to an element, also supports zoom with fixed scale. Navigation by means of selection filters. Quick filters through the contextual menu. Available in English, Galician, Spanish, Portuguese, French and German. 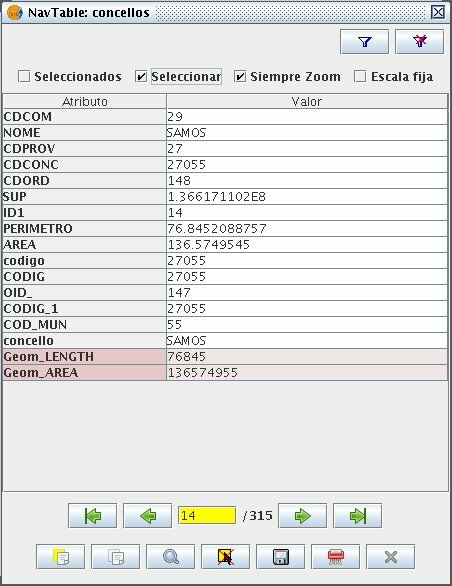 In order to use NavTable, first we must select a layer into the gvSIG's TOC and press the button . This will open the NavTable window and from now on it will be possible to deal with using its buttons and checkboxes. NavTable is an official extension of gvSIG, which means that gvSIG versions from 1.10 and onwards are bundled with it by default. You have not to worry about it. If you want to install NavTable manually you can download the binary files for the required version and unzip the folder es.udc.cartolab.gvsig.navtable into [gvSIG_installation_path]/bin/gvSIG/extensiones/. Even if the file has .gvspkg as extension, this is a zip file that can be decompressed. NavTable is under continuos development, incorporating new features, fixing bugs, etc. That's why all the suggestions, ideas, comments, bug reports will be welcome. Users mailinglist: we listen at several gvSIG users mailinglists. Bug reports: bug tracker system. Translations: user manual is available in English, Spanish and Italian. Some volunteer?. Help us to make NavTable better! Copyright (c) CartoLab, 2009-2014. Copyright (c) iCarto, 2011-2014. 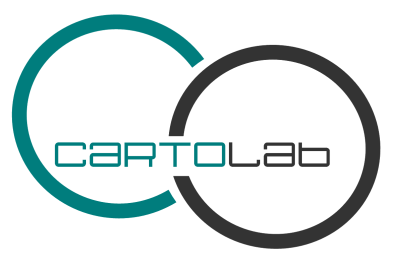 CartoLab is managed by: Fco. Alberto Varela García.